BACKGROUND : The changes in lipid profile have long been associated with cancer because lipids play a key role in maintenance of cell integrity. AIMS : The present study evaluated alterations in plasma lipid profile in untreated head and neck cancer patients as well as patients with oral precancerous conditions (OPC) and its association with habit of tobacco consumption. MATERIAL AND METHODS : This hospital-based case control study included 184 head and neck cancer patients, 153 patients with OPC and 52 controls. Plasma lipids including: (i) Total cholesterol, (ii) LDL cholesterol (LDLC), (iii) HDL cholesterol (HDLC) (iv) VLDL cholesterol (VLDLC) and (v) triglycerides were analysed by spectrophotometric kits. STATISTICAL ANALYSIS USED : Student's t-test was performed to compare mean values of the parameters. RESULTS : A significant decrease in plasma total cholesterol and HDLC was observed in cancer patients (P=0.008 and P=0.000 respectively) as well as in patients with OPC (P=0.014 and P=0.000, respectively) as compared to the controls. The plasma VLDL and triglycerides levels were significantly lower in cancer patients as compared to the patients with OPC (P=0.04) and controls (P=0.059). The tobacco habituates showed lower plasma lipid levels than the non-habituates. Our data strengthen the evidence of an inverse relationship between plasma lipid levels and head and neck malignancies as well as OPC. CONCLUSION :The lower levels of plasma cholesterol and other lipid constituents in patients might be due to their increased utilization by neoplastic cells for new membrane biogenesis. The findings strongly warrant an in-depth study of alterations in plasma lipid profile in head neck cancer patients. Lipids are major cell membrane components essential for various biological functions including cell growth and division of normal and malignant tissues. Usefulness of variations in tissue/blood cholesterol levels in diagnosis and treatment of various diseases has been studied by several workers. Although, its prime role in pathogenesis of coronary heart disease has been consistently found, researchers have reported association of plasma/serum lipids and lipoproteins with different cancers.,,, The alterations in the circulatory cholesterol levels have been found to be associated with etiology of breast cancer and colorectal cancer.,, However, only a few reports are available on plasma lipid profile in head and neck cancer., Head and neck cancer is one of the leading causes of morbidity and mortality due to cancer. Its incidence is much higher in Asian countries, as compared to the West. At our Institute (The Gujarat Cancer and Research Institute), head and neck cancer accounts for about 2300 new cases every year which is around 25.3% of all cancer cases. The habit of tobacco consumption is a known etiologic factor for development of oral precancerous diseases and head and neck cancer., Patients with oral precancerous conditions (OPC) have also been reported to show a significant tendency to develop cancer. It is believed that tobacco carcinogens induce generation of free radicals and reactive oxygen species, which are responsible for high rate of oxidation/peroxidation of polyunsaturated fatty acids. This peroxidation further releases peroxide radicals. This affects essential constituents of the cell membrane and might be involved in carcinogenesis/tumorigenesis. Because of the lipid peroxidation, there is a greater utilization of lipids including total cholesterol, lipoproteins and triglycerides for new membrane biogenesis. Cells fulfill these requirements either from circulation, by synthesis through the metabolism or from degradation of major lipoprotein fractions like VLDL, LDL or HDL. Earlier reports have shown that antioxidant vitamins have protective effects against lipid peroxidation.,, Lower blood lipids have been associated with various cancers.,,, Furthermore, some investigators have also found relation of low serum cholesterol with increased risk of cancer occurrence, and mortality., The plasma concentrations of lipids are not the single additive function of intake, utilization and biosynthesis because of its continuous cycling in and out of the blood stream. The question that whether hypolipidemia at the time of diagnosis, is a causative factor or is a result of cancer has remained unanswered. Considering these curiosities, the present study was aimed to evaluate the plasma lipid profile including: (i) total cholesterol, (ii) LDL cholesterol (LDLC), (iii) HDL cholesterol (HDLC), (iv) VLDL cholesterol (VLDLC) and (v) triglycerides in head and neck cancer patients, patients with OPC and healthy individuals. The association between alterations in plasma lipid profile and habit of tobacco consumption was also studied. Fifty-two healthy individuals, who had no complaint or any major illness in recent past, were included in the study as controls. They were close relatives of the patients accompanying them during their hospitalization. One hundred fifty three patients with OPC were also included in the study from the Government Dental College and Hospital, Civil Hospital Campus, Ahmedabad. Out of these, 97 (63.4%) had oral submucous fibrosis, 44 (28.8%) had oral leukoplakia and 12 (7.8%) were with other diseases including dysplasia and verrucous hyperplasia. The hospital-based case control study included 184 untreated head and neck cancer patients, enrolled from the outpatients' department of the Gujarat Cancer and Research Institute, Ahmedabad. The patients were diagnosed as having cancer of oral cavity (n=121), pharynx (n=49), larynx (n=10) and maxilla (n=4). The diagnosis was based on clinical and histopathological examinations. Staging was done according to UICC classification. [Table - 1] provides clinicopathological details of cancer patients. 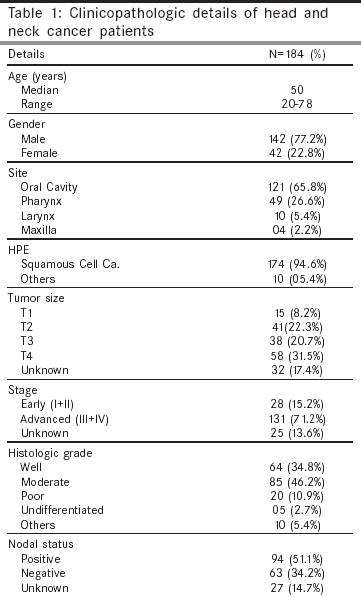 Histologically, 174 (94.6%) patients represented with squamous cell carcinoma. Twenty-eight patients had early disease (stage I and II) and 131 had advanced disease (stage III and IV). The classification according to their histological grade revealed that 64 patients had well differentiated, 85 had moderately differentiated, 20 had poorly differentiated and 5 had undifferentiated carcinoma. The subjects in each group were further classified into as having no habit of tobacco consumption (NHT) and with habit of tobacco consumption (WHT). Fasting blood samples were collected from the subjects, into EDTA containing vacuettes. Samples were centrifuged; plasma was collected and stored at -800C until analyzed. Plasma cholesterol levels were estimated using cholesterol kits obtained from Autospan Reagents, Span Diagnostics (Gujarat, India). Briefly, 5 µl of plasma sample was mixed with 500 µl of working reagent that contained cholesterol oxidase, cholesterol esterase, peroxidase, 4-amino phenanzone, surfactant, phenol, buffer, preservatives and stabilizer. The mixture was incubated at 370C for 10 minutes and absorbance was read at 505 nm. Plasma HDL cholesterol levels were also estimated using Autospan kits obtained from Span diagnostics (Gujarat, India). Briefly, 0.3 ml plasma sample was mixed with 0.3 ml precipitating reagent (PEG 6000, stabilizer and preservative), followed by 10 minutes incubation at room temperature. The mixture was centrifuged at 2000 rpm for 15 minutes. The supernatant obtained was mixed with working cholesterol reagent. After incubation of 10 minutes at 370C, absorbance was read at 505 nm. Student's t-test was performed to compare mean values of the parameters. “P” value <0.05 was considered to be statistically significant. Habit of tobacco consumption in one or the other form (smoking/chewing/snuff) is highly prevalent in this region. As depicted in [Figure - 1], 95.4% of the patients with OPC and 85.8% of the cancer patients were consuming tobacco in one or the other form. The details regarding habit of tobacco consumption are provided in [Table - 2]. Tobacco chewing in the form of readily available pouch (gutkha) and/or with lime was common in the patients with OPC and bidi (country cigarette) smoking among the cancer patients. Habit of tobacco snuff (oral/nasal) was usually observed in the female subjects, especially in female cancer patients. Use of tobacco, on an average, was greater than 10 years in all the subjects. 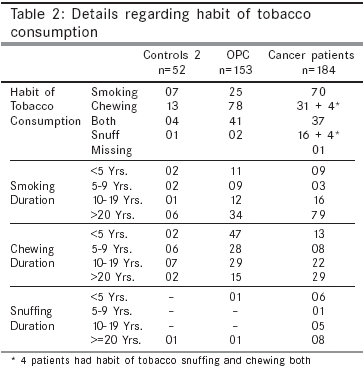 79/107 (73.8%) of the smokers in cancer patients and 34/66 (51.5%) of the smokers in patients with OPC had habit of smoking for more than 20 years. While, 29/72 (40.3%) of the tobacco chewers in cancer patients had habit of chewing for more than 20 years. The mean plasma lipid profile of controls and patients, at the time of diagnosis, are represented in [Figure - 2]. A significant decrease in plasma total cholesterol and HDLC were observed in cancer patients (P=0.008 and P=0.000, respectively) as well as in patients with OPC (P=0.014 and P=0.000, respectively) as compared to the controls. However, the mean plasma levels of total cholesterol and HDLC were comparable between patients with OPC and cancer patients. The VLDLC and triglycerides levels were lower in cancer patients as compared to the controls (P=0.059) as well as the patients with OPC (0.04). However, plasma levels of VLDLC and triglycerides were comparable between controls and patients with OPC. Plasma LDLC levels did not reveal any significant difference among all three groups. Cholesterol and triglycerides, important lipid constituents of cell, are essential to carry out several vital physiological functions. Cholesterol is essential for maintenance of the structural and functional integrity of all biological membranes. It is also involved in the activity of membrane bound enzymes and is important for stabilization of DNA helix. Cellular uptake and regulation of cholesterol is mediated by lipoprotein receptors especially located on the surface of the cells. For transport in plasma, triglycerides and cholesterol are packaged into lipoproteins, which are then taken up and degraded by cells to fulfill demands for cellular functions. In some malignant diseases, blood cholesterol undergoes early and significant changes. Low levels of cholesterol in the proliferating tissues and in blood compartments could be due to the process of carcinogenesis. The question arises whether hypolipidemia is a predisposing factor or result of cancer? However, earlier studies have reported that hypolipidemia may result due to the direct lipid lowering effect of tumor cells or some secondary malfunction of the lipid metabolism or secondary to antioxidant vitamins.,- Several prospective and retrospective studies have shown an inverse association between blood lipid profile and different cancers.,,,, Schatzkin et al and Chyou et al have observed an inverse trend between lower serum cholesterol and head neck as well as esophageal cancers. The results are strengthened by the present study showing lower plasma total cholesterol, HDLC, VLDLC and triglycerides in head and neck cancer patients and patients with OPC than the healthy individuals. Lipid peroxidation is an essential biochemical process that involves the oxidation of polyunsaturated fatty acids, the important components of cell membranes. Tobacco carcinogens generate reactive oxygen species and lipid peroxides, leading to tissue injury due to elevated lipid peroxidation, further damaging the cellular structural blocks like lipids, proteins, DNA etc. Thus, lipid peroxidation may play a role in endogenous formation of exocyclic DNA adducts. In our study, about 95% of the patients with OPC and 85% of the cancer patients were tobacco consumers. Therefore, levels of the lipids in WHT subjects in patients with OPC and cancer patients were compared with plasma lipid profile of NHT group of controls. Higher plasma cholesterol, HDLC, VLDLC and triglycerides were observed in controls without habit of tobacco consumption than controls and patients with tobacco habits. Earlier studies have shown an inverse relation between cholesterol and tobacco related cancers., Neufeld et al have reported passive smoking as a significant risk factor for decreased HDLC. Animal studies have shown that nicotine, a known tobacco carcinogen, affects activity of enzymes responsible for lipid metabolism. It is also reported that LDLC uptake and cholesterol biosynthesis were decreased in the liver of tumor bearing animals. Further, exposure to tobacco carcinogens hampers antioxidant defense, leading to accelerated lipid peroxidation. There is a strong relationship between vitamin E (a liposoluble antioxidant vitamin) and lipids, especially cholesterol. Vitamin E is co-transported with all forms of cholesterol and contributes to the first line of defense against lipid peroxidation. Further, triglycerides and cholesterol are positively correlated with vitamins. We observed a significant decrease in plasma levels of fat-soluble antioxidant vitamins such as vitamin E and b-carotene in tobacco habitués. Together, our study shows declined plasma levels of total cholesterol, HDLC, LDLC, VLDLC and triglycerides. As majority of the patients with OPC and cancer patients were with habit of tobacco, marker levels in NHT controls were compared with WHT controls, patients with OPC and cancer patients with habit of tobacco to eliminate any bias due to tobacco habit. To establish a cutoff of circulating marker level equal numbers of controls with and without habit of tobacco were enrolled. From the present study we can't predict the incidence of tobacco habitués in healthy population. In conclusion, Rose et al reported 66% higher mortality rate due to cancer in the group of cancer patients with lowest plasma cholesterol than in the highest plasma cholesterol. Our results add to this evidence of an inverse relationship between lower plasma lipid profile and head and neck malignancies and oral precancerous conditions. The lower plasma lipid status may be a useful indicator for initial changes occurring in neoplastic cells. However, a detailed study of cholesterol carrying lipoprotein transport and the efficiency of the receptor system may help in understanding the underlying mechanisms of regulation of plasma cholesterol concentrations in cancer. Further work on these interesting results as well as in-depth studies on lipoprotein transport and receptor system is in progress in our laboratory. The authors are sincerely thankful to Cancer Treatment Research Foundation, Washington, D.C., USA, for providing financial support (Grant No. G-96-134) for this study. 1. Schatzkin A, Hoover RN, Taylor PR, Ziegler RG, Carter CL, Albanes D, et al. Site-specific analysis of total serum cholesterol and incident cancers in the National Health and Nutrition Examination Survey I epidemiologic follow-up study. Cancer Res 1988;48:452-8. 2. Halton JM, Nazir DJ, McQueen MJ, Barr RD. Blood lipid profiles in children with acute lymphoblastic leukemia. Cancer 1998;83:379-84. 3. Simo CE, Orti LA, Sena FF, Contreras BE. Blood cholesterol in patients with cancer. An Med Interna 1998;15:363-6. 4. Allampallam K, Dutt D, Nair C, Shetty V, Mundle S, Lisak L, et al. The clinical and biologic significance of abnormal lipid profiles in patients with myelodysplastic syndromes. J Hematother Stem. Cell Res 2000;9:247-55. 5. Gerber M, Richardson S, DePaulet PC, Pujol H, DePaulet AC. Relationship between vitamin E and polyunsaturated fatty acids in breast cancer: Nutritional and metabolic aspects. Cancer 1989;64:2347-53. 6. Gerber M, Cavallo F, Marubini E, Richardson S, Barbieri A, Capitelli E, et al. Liposoluble vitamins and lipid parameters in breast cancer. A joint study in Northern Italy and Southern France Int J Cancer 1988;42:489-94. 7. Forones NM, Falcan JB, Mattos D, Barone B. Cholesterolemia in colorectal cancer. Hepatogastroenterology 1998;45:1531-4. 8. Chyou PH, Nomura AM, Stemmermann GN, Kato I. Prospective study of serum cholesterol and site-specific cancers. J Clin Epidemiol 1992;45:287-92. 9. Annual report of Population Based Cancer Registry Ahmedabad Urban Agglomeration Area and Hospital Based Cancer Registry of The Gujarat Cancer and Research Institute, Ahmedabad, India. 1997. 10. Mirbod SM, Ahing SI. Tobacco associated lesions of the oral cavity: Part I, Non- malignant lesions. J Cancer Dent Assoc 2000;66: 252-6. 11. Mirbod SM, Ahing SI. Tobacco associated lesions of the oral cavity: Part II. Malignant lesions. J Cancer Dent Assoc 2000;66:308-11. 12. Tradati N, Grigotat R, Calabrese I, Costa L, Giugliano G, Morelli F, et al. Oral leukoplakias: to treat or not? Oral Oncol 1997;33:317-21. 13. Ames BN. Dietary carcinogens and anticarcinogens: Oxygen radicals and degenerative diseases. Science 1983;221:1256-64. 14. Choi MA, Kim BS, Yu R. Serum antioxidative vitamin levels and lipid peroxidation in gastric carcinoma patients. Cancer Lett 1999;136:89-93. 15. Odeleye OE, Eskelson CD, Mufti SI, Watson RR. Vitamin E inhibition of lipid peroxidation and ethanol-mediated promotion of esophageal tumorigenesis. Nutr Cancer 1992;17:223-34. 16. Burton GW, Ingold KU. ?-carotene: An unusual type of lipid antioxidant. Science 1984; 224:569-73. 17. Gilbert MS, Ginsberg H, Fagerstrom R, Brown WV. Characterization of hypocholesterolemia in myeloproliferative disease: Relation to disease manifestations and activity. Am J Med 1981;71:595-602. 18. Alexopoulos CG, Blatsios B, Avgerinos A. Serum lipids and lipoprotein disorders in cancer patients. Cancer 1987;60:3065-70. 19. Larking PW. Cancer and low levels of plasma cholesterol: the relevance of cholesterol precursors and products to incidence of cancer. Prev Med 1999;29:383-90. 20. Williams RR, Sorlie PD, Feinleib M, McNamara PM, Kannel WB, Dawber TR. Cancer incidence by levels of cholesterol. J Am Med Assoc 1981;245:247-52. 21. Eichholzer M, Stahelin HB, Gutzwiller F, Ludin E, Bernasconi F. Association of low plasma cholesterol with mortality for cancer at various sites in men: 17-y follow-up of the prospective basel study. Am J Clin Nutr 2000;71:569-74. 22. Cambein F, Ducimetiere P, Richard J. Total serum cholesterol and cancer mortality in a middle-aged male population. Am J Epidemiol 1980;112:388-94. 23. Hermanik P, Sobin LH. International Union against Cancer (UICC): TNM Classification of malignant tumours, Head and Neck Tumours, 4th edn. Geneva: Springer; 1987. 24. Sabine JR. Cholesterol. New York: 1977. 25. Feinleib M. Review of epidemiological evidence for a possible relationship between hypocholesterolemia and cancer. Cancer Res 1983;43:2503S-7S. 26. Dyer AR, Stamler J, Paul D, Shekelle RB, Schoenberger JA, Berkson DM, et al. Serum cholesterol and risk of death from cancer and other causes in three Chicago epidemiological studies. J Chronic Dis 1981;34:249-60. 27. Kark JD, Smith AH, Switzere BR, Hames CG. Retinol, carotene, and the cancer/cholesterol association. The Lancet 1981;1:1371-2. 28. Kark JD, Smith AH, Hames CG. Serum retinol and the inverse relationship between serum cholesterol and cancer. Br Med J 1982;284:152-4. 29. Peto R, Doll R, Buckley JD, Sporn MB. Can dietary b-carotene materially reduce human cancer rates? Nature 1981;290:201-8. 30. Budd D, Ginsberg H. Hypocholesterolemia in Acute myelogenous leukemia. Association between disease activity and plasma low density lipoprotein cholesterol concentrations. Cancers 1986;58:1361-5. 31. Kesaniemi YA, Witzlum JL, Heinbrecher UP. Receptor-mediated catabolism of low density lipoprotein in man. Quantitation using glycosylated lipoprotein. J Clin Invest 1983; 71:950-9. 32. Brown MS, Kovanen PT, Goldstein JL. Regulation of plasma cholesterol by lipoprotein receptors. Science 1981;212:628-35. 33. Dessi S, Batetta B, Pulisci D, Spano O, Cherchi R, Lanfranco L, et al. Altered pattern of lipid metabolism in patients with lung cancer. Oncology 1992;49:436-41. 34. Favrot MC, Dellamonica C, Souillet G. Study of blood lipids in 30 children with a malignant hematological disease or carcinoma. Biomed. Pharmacother 1984;38:55-9. 35. Neufeld EJ, Mietus SM, Beiser AS, Baker AL, Newburger JW. Passive cigarette smoking and reduced HDL cholesterol levels in children with high-risk lipid profiles. Circulation 1997;96:1403-7. 36. Ashakumary L, Vijayammal PL. Effect of nicotine on lipoprotein metabolism in rats. Lipids 1997;32:311-5. 37. Reddy KK, Rao AP, Reddy TPK. Serum vitamins E, A and lipid peroxidation levels in Kurichias, an Indian tribal population. Indian J. Biochem. Biophys 1999;36:44-50. 38. Raval GN, Patel DD, Sainger RN, Shah MH, Shah JS, Patel MM, et al. A study of various sociodemographic factors and plasma vitamin levels in oral and pharyngeal cancer in Gujarat, India. Asian Pacific J Cancer Prev 2001;2:215-24. 39. Rose G, Shipley MJ. Plasma lipids and mortality: A source of Error. The Lancet 1980;1:523-6. Sherubin, E.J. and Kannan, K.S. and Kumar, D.N. and Joseph, I.
Asegaonkar, S. and Chaudhari, S.C. and Bardapurkar, J.S. Kumar, P. and Augustine, J. and Urs, A.B. and Arora, S. and Gupta, S. and Mohanty, V.R. Ellis, M.H. and Baraf, L. and Shaish, A. and Har-Zahav, A. and Harats, D. and Ashur-Fabian, O.
Chang, N.W., Tsai, M.-H., Lin, C., Hsu, H.T., Chu, P.-Y., Yeh, C.-M., Chiu, C.-F., Yeh, K.-T.
Moutzouri, E., Elisaf, M., Liberopoulos, E.N. Abaza, H., Ghanem, A., Jmal, A., Harzallah, L., Rahal, K., Guemira, F.
Peetla, C., Bhave, R., Vijayaraghavalu, S., Stine, A., Kooijman, E., Labhasetwar, V.
De Feo, E., Rowell, J., Cadoni, G., Nicolotti, N., Arzani, D., Giorgio, A., Amore, R., (...), Boccia, S.
Lohe, V.K., Degwekar, S.S., Bhowate, R.R., Kadu, R.P., Dangore, S.B. Peetla, C., Stine, A., Labhasetwar, V.
Mehrotra, R., Pandya, S., Chaudhary, A.K., Singh, H.P., Jaiswal, R.K., Singh, M., Gupta, S., Singh, M.
Anandakumar, P., Jagan, S., Kamaraj, S., Ramakrishnan, G., Clara, J.B., Pathitha, D., Kavitha, T., Devaki, T.
Jiang, J., Nilsson-Ehle, P., Xu, N.